NORTH BEND – The city of North Bend may be getting a little bigger. The city has begun the process of annexing the Pioneer Lake housing development and North Bend Golf Course southwest of the current city limits. A public open house will be held to discuss the proposed annexation at 7 p.m. May 8 at the city auditorium. Two areas are being considered for annexation. 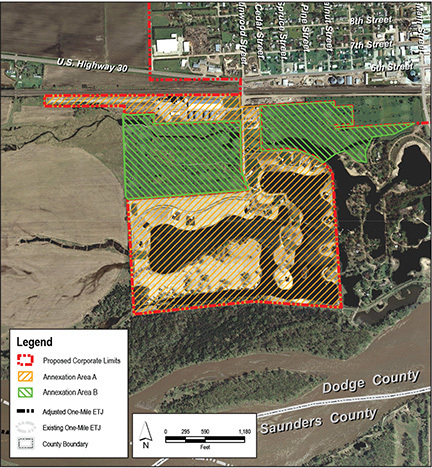 “Area A” consists of the Pioneer Lake development and Frontier Coop. “Area B” consists of the majority of North Bend Golf Course. One option being considered would annex just Area A. The other option would annex both Area A and B. According to a flyer produced by the city, the intent of the annexation is to provide for the orderly growth of the North Bend. Annexation enables the city to plan for and provide municipal services efficiently, as well as guide future community growth patterns. The flyer also says annexation would raise property taxes of the affected area by about $230 per $100,000 of valuation. Affected residents would also see a decrease of approximately $96 in water service fees. The city would also take over maintenance of the streets from the Pioneer Lake Homeowners Association. The city has decided that the annexed streets will remain gravel. Following the public open house, the North Bend planning commission will consider the annexation with a public hearing May 29. The city council would then consider the proposal with a public hearing June 5. The earliest the annexation could take effect after undergoing three readings at council meetings would be July 17.